When you want to bottle your own special hot sauce recipe, this 5 oz. clear glass hot sauce bottle with black cap and orifice reducer is the perfect bottle to put it in. With its orifice reducer, this bottle serves up a small quantity of whatever is stored inside, helping to reduce the risk of over-seasoning. Not just for hot sauce, the bottle is great for any type of condiment or sauce that has a powerful flavor. If you bottle your sauce for sale, then take advantage of our bulk order discounts. Order while they're HOT! Clear glass bottle is ready for your custom label but equally handsome when left unlabeled. Designed specifically for hot sauce but can also be used for other condiments or sauces. This glass bottle also makes great packaging for handmade gifts and party favors. Orifice reducer fits securely on the bottle and limits the amount dispensed. Black cap is easy to twist, yet closes the bottle tightly to prevent spillage. 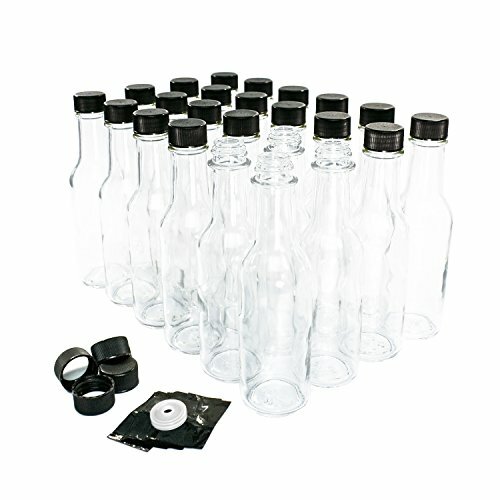 Shrink bands included with each bottle. Holds up to 5 ounces. If you have any questions about this product by GBO GLASSBOTTLEOUTLET.COM, contact us by completing and submitting the form below. If you are looking for a specif part number, please include it with your message.